Tea bags are the most used disposable tea packets around and is the best way of selling tea. Tea bags are made out of supper fine organic material which is food safe and is also safe when dropped into water and don’t dissolve. Tea bag material is made out of special paper that has little pores into it that help water goes inside and mix with tea inside the packet and gets out. Tea bags usually have a string attached to them for easy handling and a tag is attached to this string which is printed with company info. There are hundreds of tea making companies out there in the market. Some companies are focusing on selling the natural tea and some are concentrating selling green tea packaged in custom tea packaging. Lots of green tea making companies are entering into American market because of the market for this product is expanding very rapidly. Original green tea is hard to find with all its organic advantages intact. Because this product helps a lot in weight loss that is why more and more Americans adding this product into their daily intake schedule. As the market is expanding for this product, the market for Tea Packaging is also expanding because tea bags cannot be sold without proper box packaging. There are many source of custom tea packaging available and its important to find the right one. Tea bags Packaging is made according to the number of tea bags required to go inside the box. Some of the tea bag boxes are made to hold 15 tea bags (also called the mini tea bag boxes) and some are made to hold 30 tea bags and are called medium size tea bag boxes. The on that hold 60 or more tea bags are called large tea bag box. A single tea bag holds about 2 to 4 grams of tea or herbal formula and the standard size of tea bag is about 2.5″ width x 2.75″ height. Each tea bag, after holding 2 to 4 grams of tea becomes about 0.24″ thick. So the box to hold 15 tea bags should be about 4″ in length, 2.5″ wide and about 3″ in height. The height of the custom tea packaging should be slightly more than the height of the tea bag. So 3″ height should be good enough to hold tea bag of size 2.75″ height. Now to calculate the size of tea packaging that holds 30 bags, 0.25″ should be multiplied with 30 and rest of the sizes will remain the same. So the size of tea bag box to hold 30 tea bags should be about 7.5″ Wide, 2.5″ deep and 3″ in height. Similarly to calculate the size of box to hold 60 tea bags, 0.25″ should be multiplied with 60 and rest of the sizes will remain the same. So it will become 15″x2.5″x3″. Some of the companies divide the 60 tea bags in two rows this way the length of the box gets reduced and the box is easily manageable. Like if we divide the 60 tea bags in 2 rows then the size of the box will be 7.5″x5″x3″. This size box is more manageable than a longer box of 15″ length. All above size calculation is done assuming the tea bag size be 2.5″x2.75″ but if you are using bigger size tea bags then the size of custom tea packaging will change accordingly. 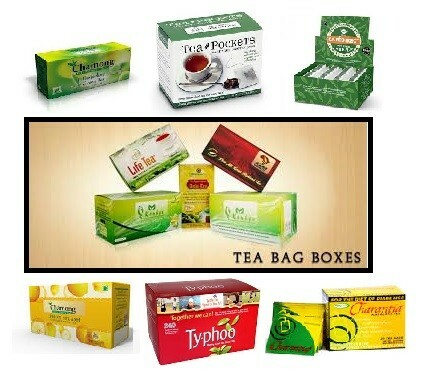 We are MyBoxPrinter are offering best Tea Boxes Wholesale at very low prices. ← Custom Board Game Boxes, The ultimate tool for Quick Game Selling!